When Tyrone crashed out of last year's race for Sam, at the last-eight stage, their shortcomings in attack featured high in the post-mortems. They confined Mayo to just 0-13 - but could only muster 0-12 themselves, missing several late chances to equalise. En route to Sunday's semi-final against the Dubs, Tyrone have amassed 6-77 in four matches for an average of almost 1-21. They have tallied 5-59 from open play. And they're punishing opponents from everywhere: they had 11 different scorers against Derry, 12 against Donegal, 11 against Down and ten against Armagh. For all the talk of Tyrone's defensive system, these are impressive stats. But is it simply a case of those Mayo misses inspiring a greater focus on attack this summer? 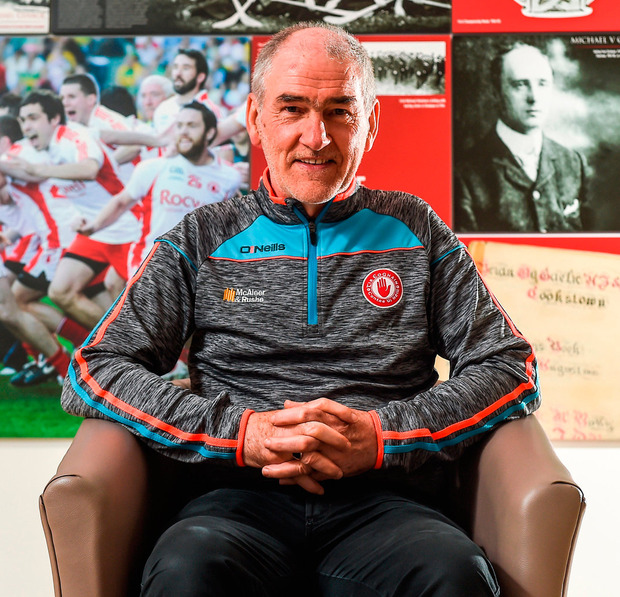 "Well, it makes you try to do better," Mickey Harte agrees. "We had a very good season up until we met Mayo and we did create many more chances than we converted. So that is something the players have thought long and hard about." His reflections on Tyrone's scoring spread are revealing. "We've worked very much on people preparing to take on shots, but you can't just wait to the day of the game to do that. We need this in training every night," the veteran manager explains. "We need players who may not normally be shooters finding themselves in positions to take scores ... we now have players who don't believe 'I get a nosebleed here' if they find themselves in a position to take a shot. [Instead, it's] 'I am prepared and capable of taking this on'. "Now, some players will obviously have a higher return for their shots than others, but that shouldn't stop other people from taking those shots - unless there's some body in a better place." Reflecting on their recent "purple patches", Harte spies value not just on the scoreboard but in the confidence they give to the entire team. But does this mean Tyrone's 2017 model is edging closer to the team of the Noughties? "It is too early to say that," Harte cautions. "It's easy to look back with rose-tinted glasses through a very successful period of our time. "We still had the so-called 'marquee forwards' at that time, which has been the big spake over the last while. "Those days, you still were dependent on somebody getting 0-6, 0-7, 0-8, or 1-4, 1-5, 1-6. Stephen O'Neill and Peter Canavan, and then a few people chipping in with that, like Owen Mulligan, Ger Cavlan, Brian Dooher. "But you always had a big-scoring forward, which probably isn't a phenomenon of the modern game. "I don't think it is right to compare this team to a previous era," he reiterates. "They have to be allowed to be judged in their own right. "Ultimately, some people will always judge a team or a squad in terms of the silverware they win - I think that's a bit narrow. "I think you have to judge them by where they were a few years ago, where they are now, and is that success? I would say 'Yes, that is success.' They have a little bit of silverware on the way to doing that too, which is no bad thing. "It's about the potential to be the best that you really look for in a squad of players. I believe that potential is there. "Whether it is realised or not right now, that's a big question. But I think this Tyrone squad is on the way to reaching the top level."